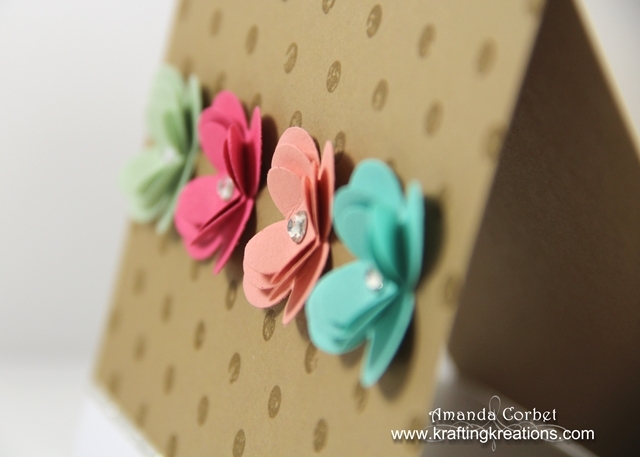 The card I’m sharing today is my absolute favorite card from the June Make and Take. This one is also a CASE from Stampin’ Up with a few additions and changes. I just love the bright fun flowers all lined up in a row! Take a look. I wanted to have one card that showcased the new 2013-2015 In colors. I started off with a 5-1/2” x 8” piece of Baked Brown Sugar card stock and scored it at 4-1/4”. The shorter side is your card front. I stamped the card front with the Distressed Dots background stamp in Baked Brown Sugar ink to add some fun pattern to the card front. Next I cut a piece of Whisper White card stock 1-1/2” x 5-1/2”. I punched one of the long edges with the Scallop Edge Border punch and adhered it behind the card front so about 1/2” of white card stock shows. I stamped the greeting from Teeny Tiny Wishes onto the Whisper White card stock in Strawberry Slush ink. I cut a piece of Silver Glimmer Paper 1/8” x 5-1/2” and adhered it along the edge of the Baked Brown Sugar card stock with a 2-Way Glue pen. Then I cut a 2-1/2” x 2-1/2” piece of each color of card stock and ran them through the Big Shot on the Floral Fusion Sizzlit one at a time to cut out the flowers. I folded the petals up on each flower and adhered each flower inside one another with Multipurpose Liquid Adhesive. I adhered the flowers onto the card front with Multipurpose Liquid Adhesive. To get them spaced evenly adhere the two outside flowers first, then adhere the inside flowers. Finally I added a large Rhinestone into the center of each flower. That’s it! It does take a little time to layer up all those flowers, but it’s so worth it! What do you think?